Baidhya faction spills PLA handover anger on streetsKathmandu Post, KATHMANDU, APR 11 – Miffed by the Special Committee decision to hand over the PLA cantonments, weapons and combatants to the Nepal Army, Maoist hardliners led by senior Vice Chairman Mohan Baidhya on Wednesday took to the streets all across the country against party Chairman Pushpa Kamal Dahal and Prime Minister Baburam Bhattarai. The faction burnt effigies of Dahal and Bhattarai as well as took out a torch rally and staged an one-hour long chhakajam. Accusing Dahal and PM Baburam Bhattarai of betraying ‘revolution’, the hardline faction has launched protests against its own government. Hundreds of cadres close to the radical faction staged chakkajam for an hour at 10 am, bringing vehicular movement in various parts of country to a standstill. Similarly, they organised a torch rally and burnt effigies of Dahal and Bhattarai throughout the country. However, police broke up a torch rally at Ranta Park rally in the Capital, which was led by party General Secretary Ram Bahadur Thapa. Security personnel from the Metropolitan Police Range Hanumandhoka used force to disrupt the rally after protesters attempted to burn effigies. “Police baton-charged during our rally in an attempt to foil our protest,” said a Maoist Central Committee member close to Baidya Maheshwor Dahal. However, police said minimum force was used as the protesters who tried to violate the rules and regulations. The faction has been saying that bringing the PLA combatants and cantonments under the Army without concluding the process of integrating Maoist combatants was a surrender by the party. It has also threatened not to participate in the process of bringing the PLA fighters, cantonments and arms under the NA control. Kathmandu, Nov 28 (IANS) A year after India started paramilitary operations against its own outlawed Maoist party and nearly five months after security forces killed a top guerrilla leader, Nepal’s Maoist party has finally reacted to the incidents officially, condemning both and underlining its continued antagonism towards the Indian government. The 14-point statement also condemned the ‘immoral and planned murder’ of Cherukuri Rajkumar, who was the spokesman of the Indian Maoists under the nom de guerre Azad. Indian police say Azad was killed during a gun battle with the guerrillas in Andhra Pradesh state in July, a claim rejected by the rebels who allege he was captured and shot dead in cold blood. [One highlight of this interview is Prachanda’s plans to forge an agreement with the reactionary Indian regime and the Chinese imperialists with the goals of developing closer economic ties and satisfying China’s and India’s “security concerns.” As part of this strategy, Prachanda is making a trip to New Delhi on November 15 to resolve the UCPN(Maoist)’s disputes with Indiia over borders and unequal treaties, in order to lessen and eventually remove Indian opposition to the UCPNM. 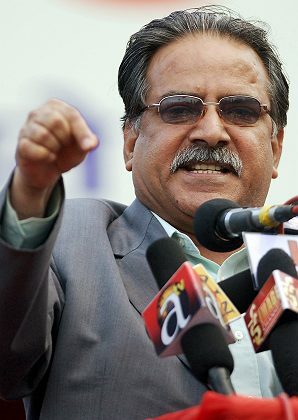 Unified Communist Party of Nepal (Maoist) – UCPN(M) – has had a difficult relationship with India and other political parties in Nepal after the fall of Maoist-led government in May 2009. The party’s several attempts to regain power have been scuttled by its widening trust gap with various political forces. As a consequence the peace process has been stalled and Nepal has been without a functioning government for over four months. Against this backdrop, Prachanda ( Pushpa Kamal Dahal), Chairman of the UCPN (M), recently visited China where he proposed to the Chinese leadership a tripartite agreement between Nepal, China, and India. Prachanda spoke to Akhilesh Upadhyay and Sudheer Sharma on Saturday morning about his visit, his party’s upcoming plenum, its relationship with India, the peace process and his fall from grace. You and your party men have been to China frequently. Some reading it as tilting towards China. It is not as it appears in the media. At an ideological level, we are naturally interested in studying developments in China. But my visits have been circumstantial. The first time I went to the Olympics. The second time I was there to study Chinese development. This time I was there to attend the Shanghai Expo. Which is not just about China for the expo is, in a sense, a world expo.